"Eurocentrism still sets the terms of restitution of African art"
“France has a long history—ever since André Malraux served as the first minister of culture (1959-69)—of using art patronage as a means of promoting soft power in Africa. For this reason, commentators immediately discerned political motives behind President Emmanuel Macron’s promise in November 2017 to formulate a five-year plan for the “temporary or definitive restitution of African cultural heritage to Africa.” They suspected that Macron sought to deflect anger over French immigration policy and the presence of French troops in West Africa. Some critics also perceived the gesture as a cheap means to shed France’s colonial legacy. The matter gains urgency at a time when France is losing its economic edge in its former colonies to China, e.g. in the competition for lucrative oil contracts off the coast of Senegal. Nonetheless, political analysis has lost out in the press over the past year to moral outrage fueled in part by the endless reproduction of a bogus statistic claiming that “90-95% of African heritage is to be found outside the continent in the major world museums.” The authors of a recent report on restitution prepared for Macron attribute this statistic to Alain Godonou, who estimated in 2007 that the “inventories” of individual African museums “hardly ever exceeded 3,000 cultural heritage objects.” Godonou’s claim about the size of African collections is sometimes dramatically wrong. 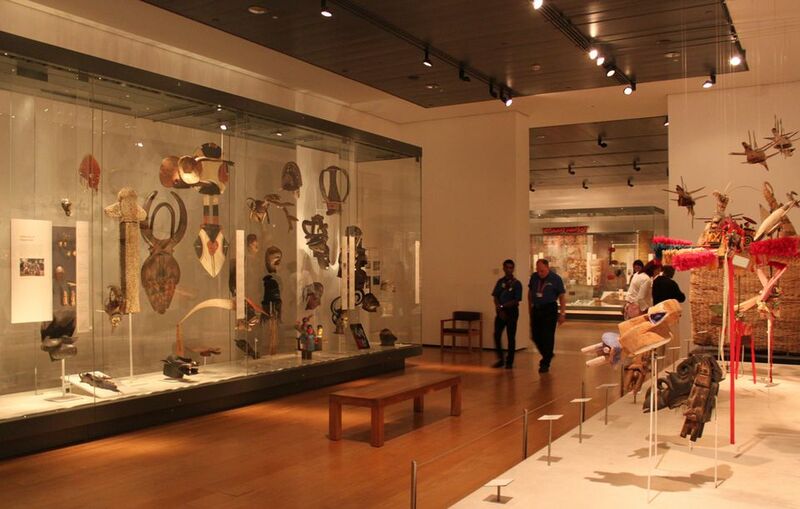 For example, some of the most celebrated works in the African art canon belong to the Nigerian National Museum and an interim report submitted to the Ford Foundation by Foster + Partners in 2008 estimated that the collection of the flagship institution in Lagos comprises 50,000 works of art dated from 900 BCE – mid-20th century. To put this in perspective, Musée Quai Branly has estimated their African holdings to be 70,000 objects. Even more seriously, what would it mean to say that 90-95% of African cultural heritage is abroad? What is or is not included in the definition of “heritage”? From my own research, I know that large camps of Eastern Pende boys in the Democratic Republic of the Congo were initiated in 2018. The boys learned approximately 125 songs, spent 2-4 hours/day perfecting their dance techniques, and mastered a corpus of proverbs necessary to participate in public trials as well as the protocols for dancing masks. According to Godonou’s calculus, the only thing in the initiation that might qualify as “cultural heritage” (patrimoine) would be the wooden face mask stripped from the body of the performer as opposed to the great wealth of artistic or cultural practices that cannot be transferred as easily to European-style museums. An online petition favouring Belgian restitution explains better what is actually being argued: “More than 90% of classical African works of art are outside of Africa.” In other words, what the statistic highlights are the art forms admired by early modernists such as Picasso and Matisse. “Classical” in commercial galleries is a term that most often refers to African works collected during the first half of the colonial period, ca. 1885-1930. Such a selective view of what constitutes cultural heritage continues the colonialist paradigm that African cultural achievement should be defined by European criteria. It also perpetuates the misguided notion that African cultural production effectively died in 1885 and everything produced thereafter is illegitimate and debased in quality. It is important to understand the Eurocentrism of Godonou’s statistic for two reasons. First, it is essential for Macron’s mission because he wishes to confine questions of restitution to objects from Africa. The powerful lobby concerned to protect works from Greece, Egypt, and China need not fear. Sub-Saharan Africa is argued to be a case apart because of its cultural impoverishment. Second, although many mundane artefacts appear in the inventories of museums, the importance of figurative sculpture in the framing of worthy heritage has made it hard for African institutions modeled on European national museums to make themselves relevant for local audiences. Colonials followed by representatives from UNESCO and various NGO’s have been building museums in Africa for 80-100 years. It is time to ask why they have not been particularly successful in cultivating African constituencies. The reasons are complex. For example, a minority of ethnic groups is responsible for the sculptures celebrated in African art surveys. Is it justified for a national museum to spend precious resources glorifying a handful of ethnic groups? Furthermore, many of the sculptures collected were religious icons and religious change in the 20th century has often made their very existence controversial. Africans have led cataclysmic iconoclastic movements for a variety of reasons since the 1910s in West and Central Africa and the phenomenon continues into the present.